When the alarm goes off at 6:30 am, it’s still dark in the tent. Once again, we’re both reluctant to loosen the drawstring around the hoodies, break the seal on our sleeping bags and make contact with the arctic air of this November morning. Once we finally do, it’s immediately clear that this morning is EVEN COLDER than yesterday. There’s only one way to handle the cold: get up, get dressed, get moving and don’t stop. Generating body heat is essential, so we move as quickly as possible as we set about our usual tasks. We reach an open sandbar by mid-morning where the sunlight finally reaches the river bottom and decide to take our first break of the day. The warm sunlight feels like heaven, and, for the first time since we left the tent this morning, we can finally stop moving for a bit. We find a nice log where we can take a break and soak in the precious sunlight. After checking the map, we realize that this will likely be our last stop before leaving the river a few bends from where we are. We plan on camping atop the mesa tonight, where we won’t have any access to water, but at least we will be dry! We top up to three liters each and head on our way. The trail splits at this point into three different directions. We spot a low ridge that heads up along Indian Creek to the east, but our route up to the mesa that separates the Middle and West Forks is less obvious at first glance. 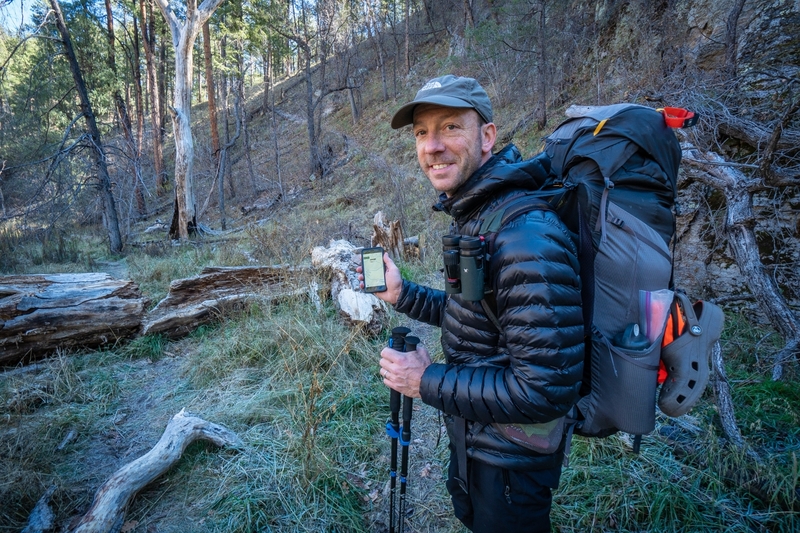 Thankfully the Gaia app which we are using for the first time has allowed us to download the GPS coordinates of a route done by a previous hiker. This really comes in handy here and prevents us from heading down the wrong path. Since our feet are still essentially frozen, we are keen on not wasting any time. 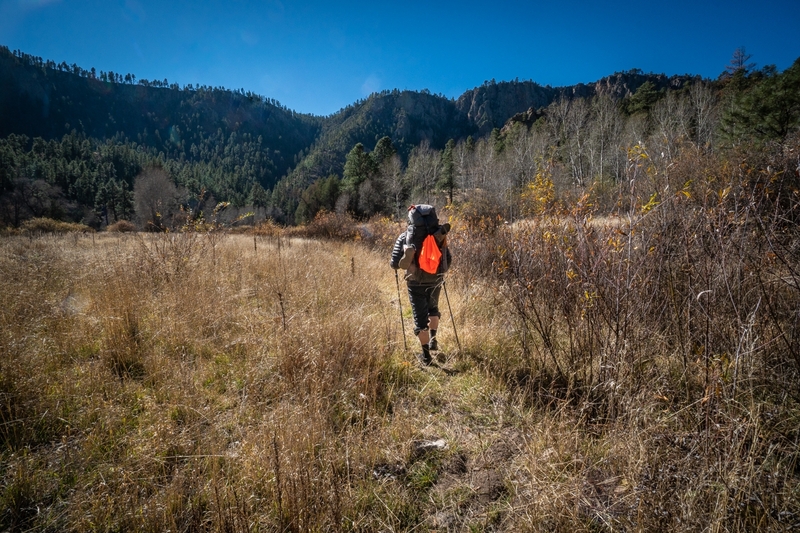 We are in search of the Big Bear Canyon Trail that will lead us away from the river and up to bright, warm sunlight. Hopefully, we can generate some heat during the ascent and find a nice spot for lunch where we can warm our feet in the sun. According to the GPS tracks, we overshot our trail by a few hundred feet, so we trace our footsteps back and spot the trail up more easily coming from this direction. 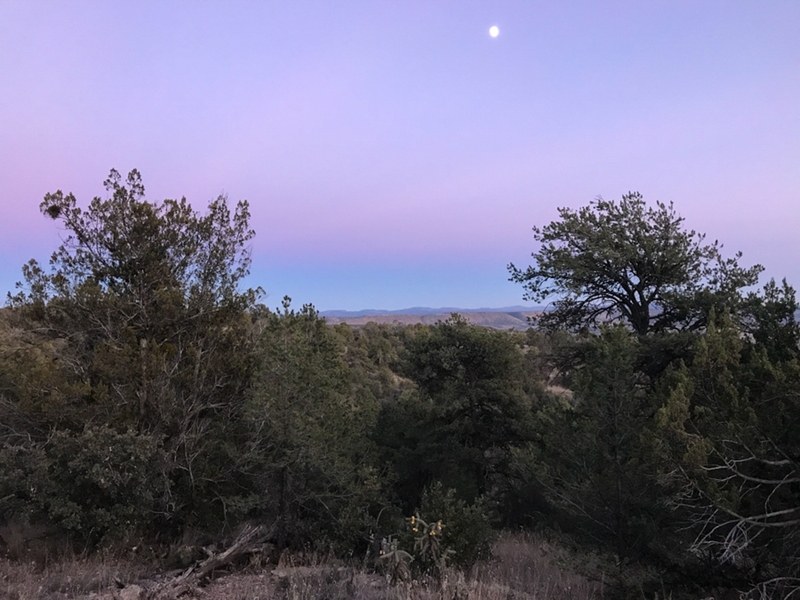 From here, it’s a 1000-foot climb up on easy switchbacks as we gain ever more expansive views down to The Meadows and beyond the canyon to the greater Gila Wilderness. When we reach the top, we stop at the first comfy log in direct sunlight, quickly get out of our cold wet shoes and shed a few layers. How glorious to be truly warm for the first time in several days! We have a leisurely lunch before heading off. 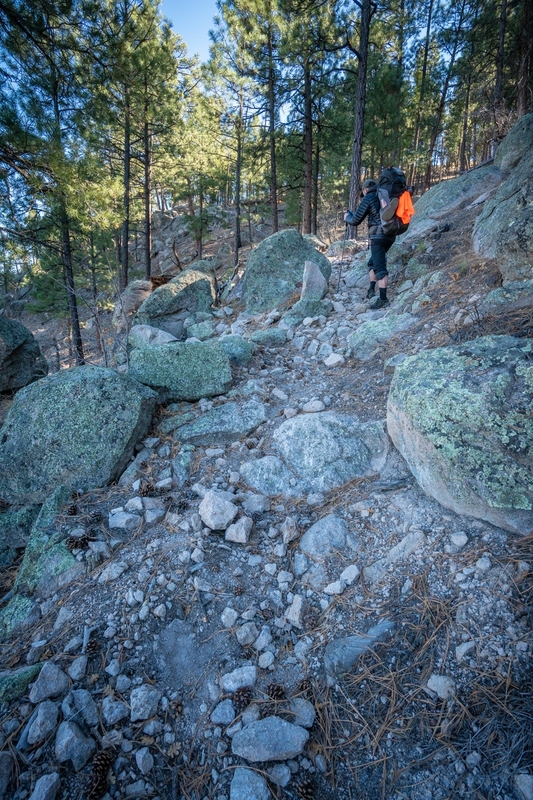 The Big Bear Canyon Trail meanders up and down over the mesa through a Ponderosa pine forest. 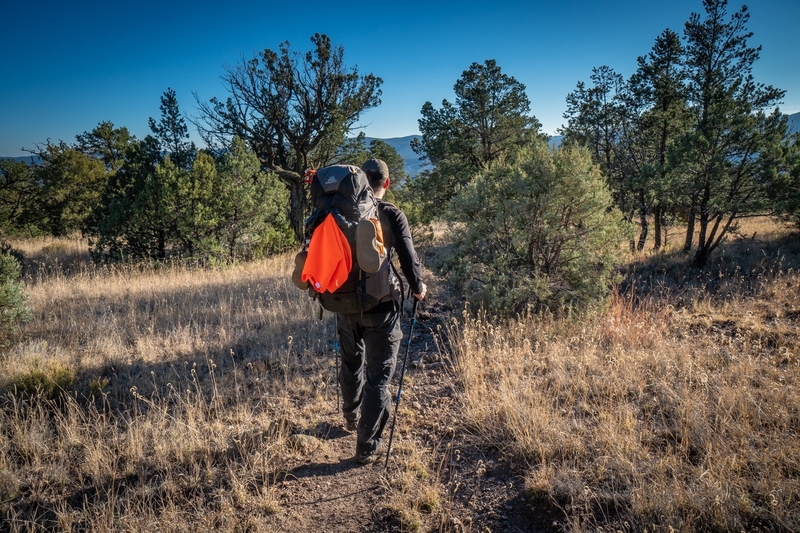 Late in the afternoon, we pass the only other backpacker that we encounter in the entire four days we are out. He is a college student taking advantage of his fall break. We trade intel quickly as the shadows are getting long and we all need to find camp for the evening. 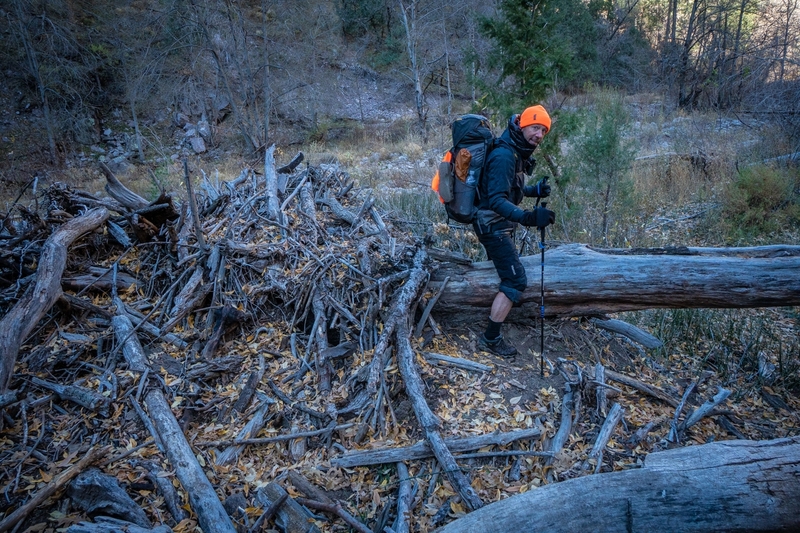 He is surprised to hear how cold it is down in the Middle Fork and how many river crossings lie ahead for him. We, by contrast, are relieved to hear that we will only face four river crossings on the West Fork, which we will tackle tomorrow on a shorter hiking day. By 4:00, we are in search of a campsite. Surprisingly, there aren’t too many to be found up here. We figure that most people prefer to camp near water and must just hike up and over. But our daylight is already running out, so any flat space where we can pitch a tent and build a fire will have to do. Just after 4:30, we see a decent option and take it. 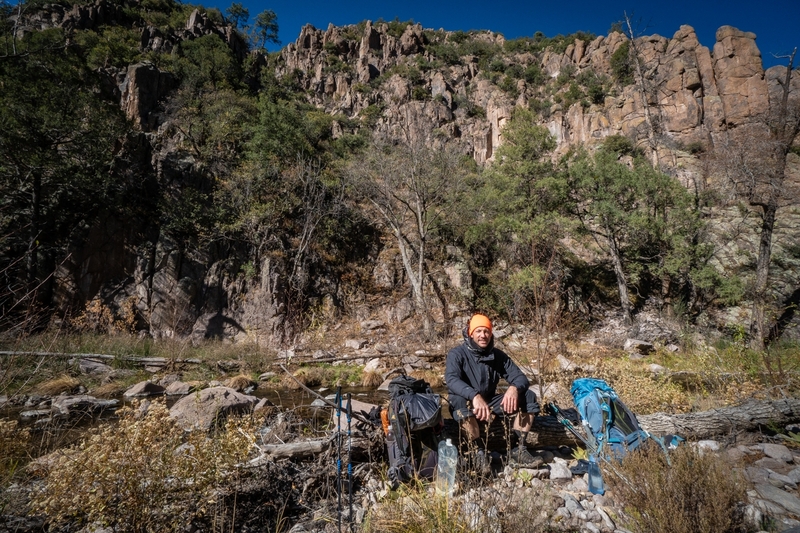 We can tell by our map that the trail starts to descend and contour around a hill from here, so this is likely our last option for camp before reaching the river 1000 feet below. Am enjoying your trip ! 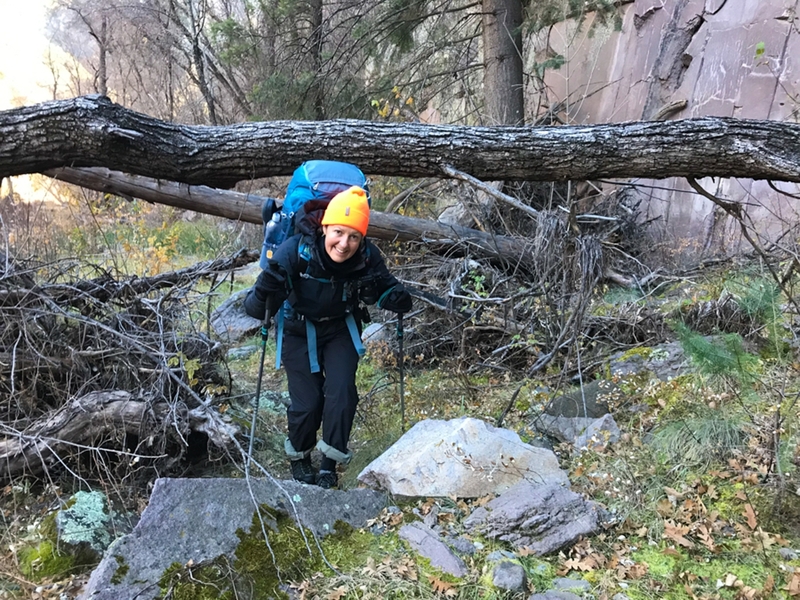 I’ve done some hiking in AZ and NM (NM’s ‘scrubiness’ caught me by surprise) but never where you are currently venturing, so it is a good education for me. Thanks ! Thanks so much! 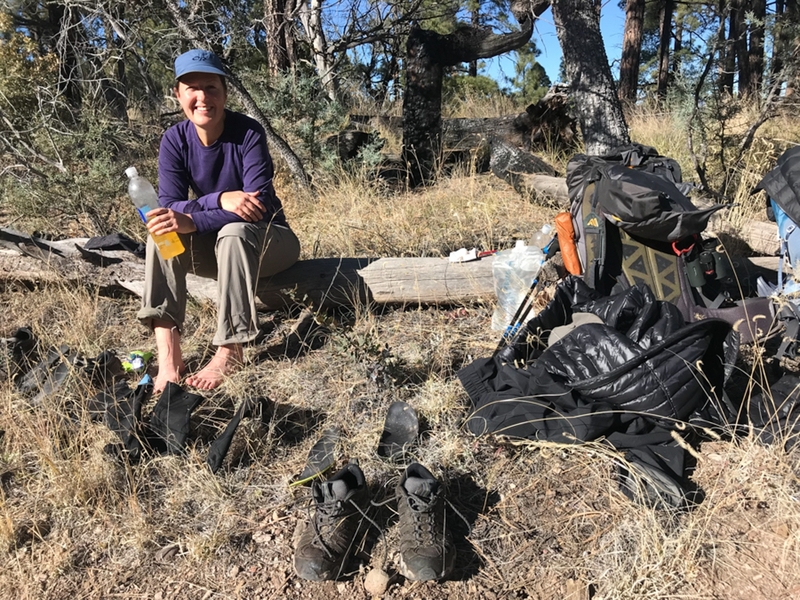 This was a nice introduction to backpacking in New Mexico, but the cold temperatures were definitely tough. We think that October is probably the ideal time to be there. We hope you can make it to the Gila in the near future. Thanks for reading!